A dirt-cheap dual-band wireless solution. The top performing home consumer wireless routers on the market run several hundred dollars. If you include mesh networking kits, you could be looking at an upfront cost of $500 or more. Those are all fine and dandy, but if it's just basic wireless you're looking for, Trendnet's TEW-810DR is on sale at Dell for just $10 (down from $40). It's not an earth-shaking bargain by any means, but for a Hamilton, it's a decent deal. 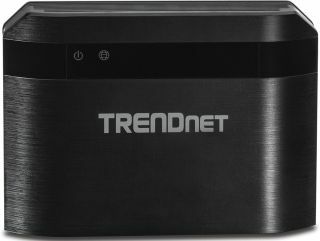 The TEW-810DR is a dual-band wireless router marketed as AC750. That breaks down 433Mbps of theoretical bandwidth available on the 5GHz (802.11ac) band and 300Mbps on the 2.4GHz (802.11n) band. As with most wireless routers, there's a built-in 4-port switch on the backside. However, it lacks any USB connectivity, so you can't plug in a USB storage drive or printer. The TEW-810DR does support beamforming, a fancy technology introduced with 802.11ac that focuses signals on supported devices for better performance. Think of it as pointing a flashlight at the subject rather than turning on a lamp. That's basically what beamforming does. With regards to real-world performance, I would expect it to be serviceable for a modest setup. I've played with a reviewed both Trendet's TEW-813DRU (scored an 8/10 verdict) and TEW-818DRU (scored a 7/10). The TEW-810DR falls below both of those in specs but seems to be generally liked in user reviews at different online vendors. Anyway, for those of you looking for a cheap Wireless-AC router, go here. If you have more to spend, be sure to check out our guide to the best gaming routers.